Mandalay – Was Kipling right ? 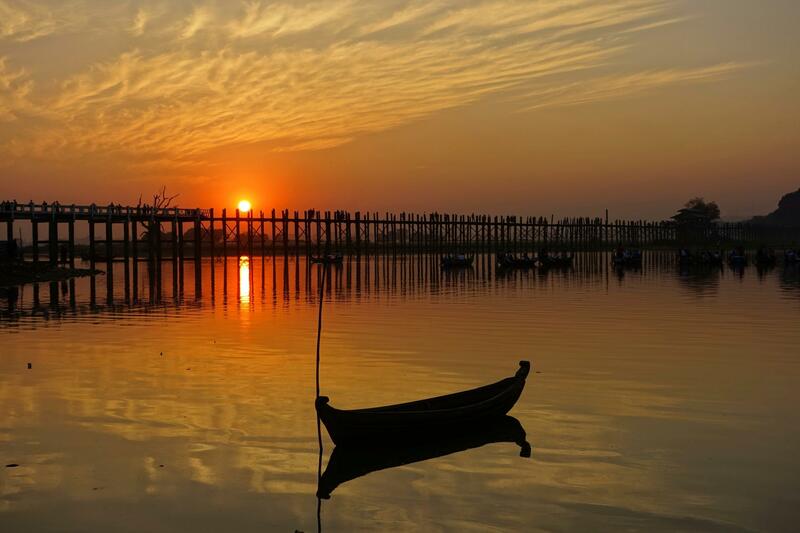 We plan two days in Mandalay, well let’s make sure we spend the minimum time in the center. On our first day, we rent the service of a taxi and his good English speaking driver who will bring us to the main attractions located outside Mandalay. 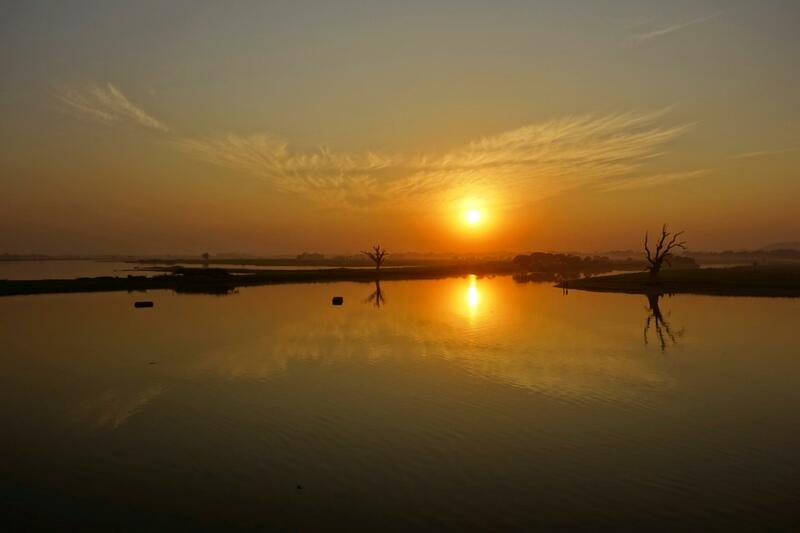 We start with Sagaing Hill located by the Ayeyarwady river, then moved further north to Mingun and end up the day with a magnificient sunset at U Bein’s teak bridge. 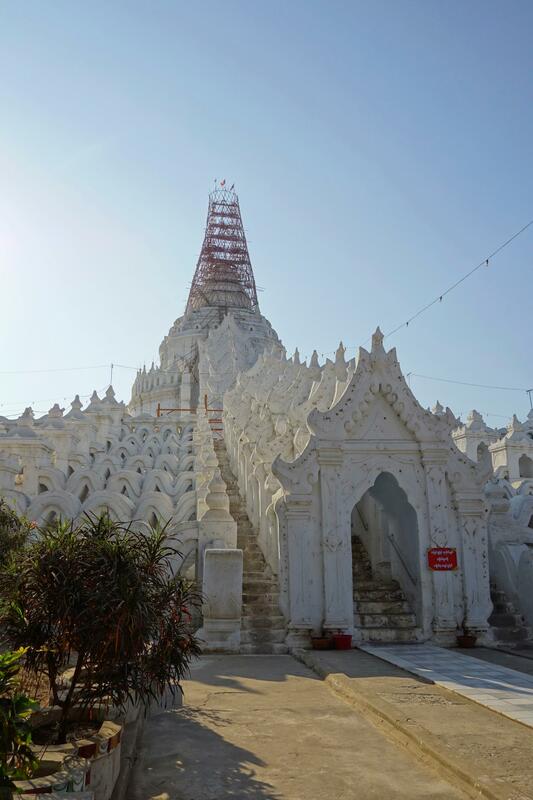 The Sagaing hill is filled of thousand of pagodas and temple golden and white. At the foot of the hill, the Burmese installed their garden along the Ayeyarwady river. Some pics about Sagaing Hill. 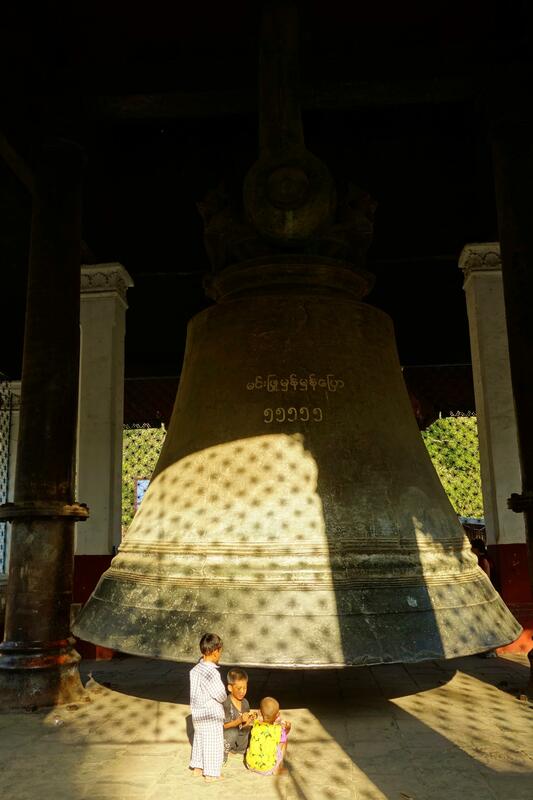 – The first one is a massive and heavy bell weighting 90 tonnes, 13 feet hight and 16 feet wide on its lower base. – The Mingun paya. It construction started in 1790 but stopped after the death of the King who ordered it. If completed, it would have been the world largest, biggest and highest pagoda. Only a third has been built and this is today a 240 feet cube standing on a 460 feet base. Today, it is considered as the largest bricks pile in the world. 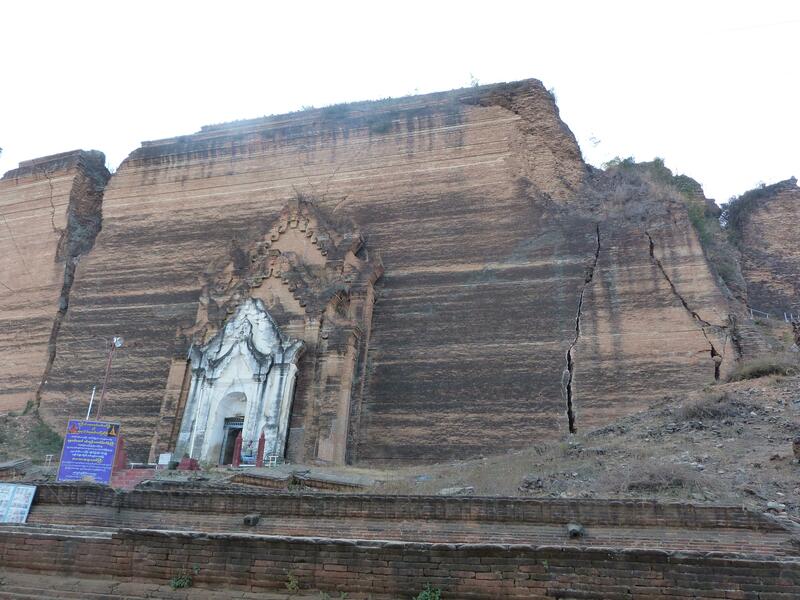 – Finaly the last attraction is the Hsinbyume Paya Pagoda which would have been built using the bricks from his unfinisged neighbourg. 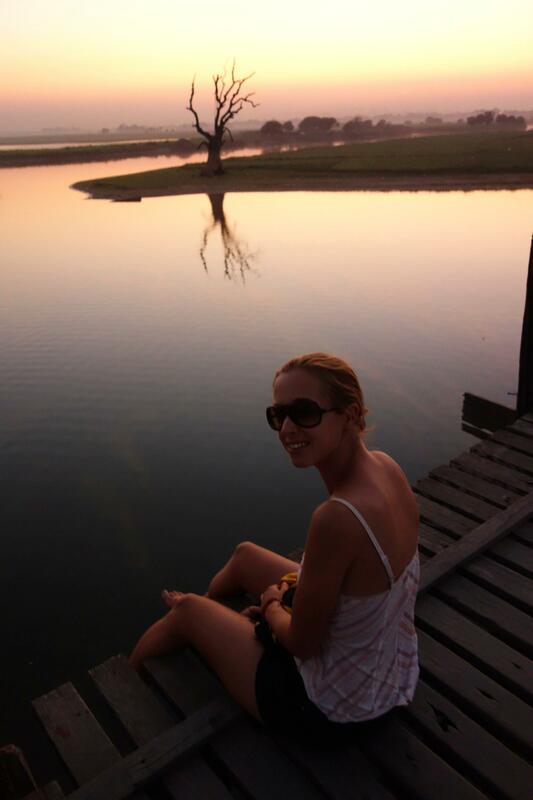 We ended up our day with the traditional Sunset at U Bein’s Bridge. This is the longest teak bridge for a total length of 1300 yards soit 1.2km. We got there just on time, and the bridge is filled up with tourists and locals selling objects and animal quite strange. The bridge is half above the Taungthaman Lake (where you can rent a boat to observe the Sunset) and as well the locals garden where they grow many different types of vegetable. Pics of the U Bein’s bridge. The next morning, our second day in Mandalay, we visit by foot and still are able to escape the noisey and smelly center. 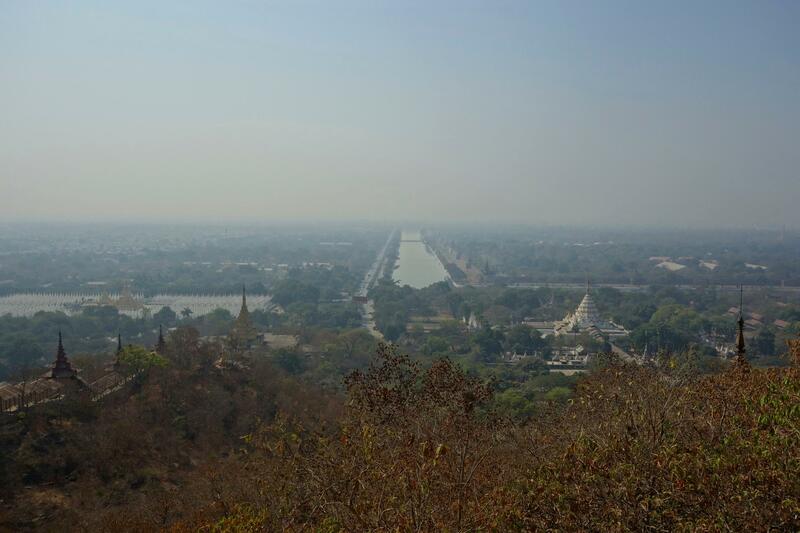 We climb Mandalay hill which offers a great 360 degrees view on the city and his royal palace we haven’t visited. From the top, you can see as well how much the city is polluted. After a 45 minutes climb naked foot (compulsory), you are asked to pay a fee to be able to take pictures with your camera… Nasty… Money that obviously goes to the government…. Before heading to Bagan by night bus the same night, we headed off to the public swimming pool to cool down.